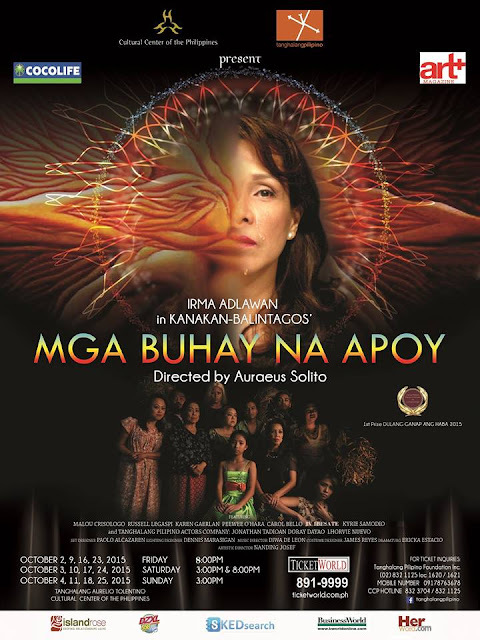 In Tanghalang Pilipino (TP)'s MGA BUHAY NA APOY, a Manila-based family comes face to face with the harsh reality of extremely strained relationships resulting from the cowardly denial of some painful truth about their past and from the utter disregard for their glorious indigenous Palawan cultural roots and spiritual traditions. Kanakan-Balintagos' stage play MGA BUHAY NA APOY, Tanghalang Pilipino's second offering for its 29th Theater Season is not just about the healing of the shattered relationships between a mother and her children in one specific Filipino family broken apart by domestic filial conflicts. MGA BUHAY NA APOY theatricalizes the inevitable destruction, not only of the basic family unit, but of an entire human society that has been relentlessly ignoring its primary responsibility of caring for its earthly beginnings--the natural resources, the endemic inhabitants of ancestral lands, the intangible cultures of the indigenous peoples, the unseen spirits that take care of the air, land and sea, the ancient human values that have timeless relevance, that are all needed to save, not just one mother or one family, but beloved Mother Earth. The ensemble is a strong group of reliable, exceptionally talented artists lead by Ms. Irma Adlawan, one of Philippine Theater's best, Peewee O’Hara, Malou Crisologo, Carol Bello, Russell Legaspi, Karen Gaerlan, Raymond Dimayuga, PHSA's Kyrie Samodio, and Tanghalang Pilipino's Actors Company members Jonathan Tadioan, Doray Dayao, Lhorvie Nuevo. The artistic team is made up of Production designer Architect Paulo Alcazaren, Lighting designer Dennis Marasigan, Costume designer James Reyes, Music composer Diwa de Leon and Dramaturg Ericka Estacio. MGA BUHAY NA APOY opens on October 2, 2015 and will run until October 25, 2015 at the Tanghalang Aurelio Tolentino of the Cultural Center of the Philippines. For tickets and other information, call 09178763678| 09273629081 (Marketing and Sales Department).